If someone had told me that I was going to have a business I would not have believed it. Now that I have a business, I am so happy that it is all about GOOD THINGS! For me, something good is a unique article, made with care or even love and with amazing workmanship. It is not necessarily something branded. That is why I work with artisans. I choose first their products and then if everything goes well I befriend them. My aspiration with this business is to be that little corner shop that physically exists in many markets around the world, where people go confidently to find a nice unique object, to discover what else may be for sale, to have a small chat with the owner. In my case the shop will be virtual, but the experiences, the objects, the love that my suppliers put into their wears is REAL. My role in the whole enterprise is to be the bridge between the experience of creating and you, the buyer in search of originality and charm. I do not make the product, but I definitely have an input in its creation. Sometimes, I find the object as it is, sometimes I find something similar and I try to curate the process in order to get what I imagine is its full potential. All the artisans I work with have an amazing sense of color and proportion, they love their craft and they want to make their art a vehicle to communicate with their community and many others around the world. Finally, I am a very lucky person: I have been blessed with the opportunity to live in many places around the world so I am familiar and at ease with establishing the relationships and working with the different mentalities. ( Chile, Mexico, Belgium, Turkey and the USA, where I live right now with my husband and five boys) I go to Turkey, Morocco, Bolivia, Chile on a regular bases to choose what I post on my shop. 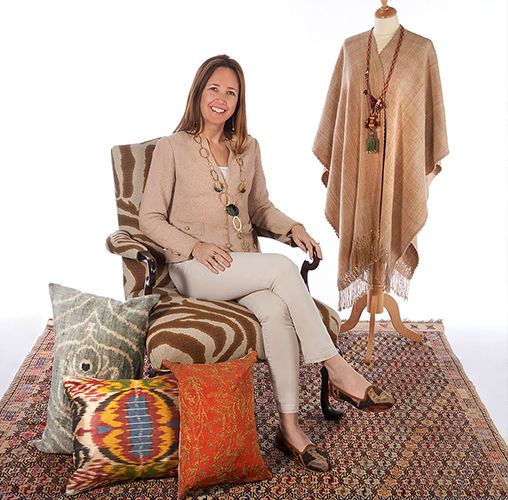 I also go to Europe and Mexico sometimes to get inspired and to fill SUZANI DESIGNS with uniqueness and cool accessories for you and your house. SUZANI means embroidery in persian, and it is a good name for my business not only for the similitude with my own name SUSANA, but because it conveys the idea of dedication and reflexion. The artisan who embroils, weaves, saws or make something out of clay imprints a vision in a corporeal being. That vision requires dedication to make the object desirable and usable. The result is an article that is nor part of a series, but the fulfillment of the process of creation in time. I hope SUZANI can bring that in to your life!